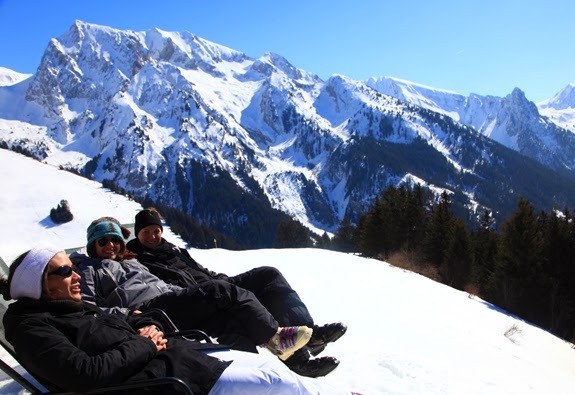 Recently, in our continued efforts to bring the best “new” resorts to our clients, we traveled to France to explore the ski resorts of the Haute-Savoie region, La Clusaz, Le Grand Bornand, Manigod and St-Jean de Sixt located just an hour drive from the Genève airport. I have read that the French Alps seduces travelers with its breathtaking views, idyllic village’s, gastronomic feasts and world class mountain activities. The Lake Annecy resorts did not disappoint. Surrounded by the majestic Aravis mountain range these resorts combine authentic traditional villages with chic chalets and refined hotels. The multi-lingual resort staff and mountain guides offer unsurpassed service with a welcoming smile. The abundance of unique outdoor activities in the valley includes the world’s first bungee jump off a ski ramp, sledge riding (sledding) and the Biathlon, a winter Olympic sport. Le Grand Bornand is home to famed Olympian Sylvie Becaert . So if you are looking for a ski holiday that may be off the beaten track then we have the resort for you. Let us help you make your travel experiences extraordinary.